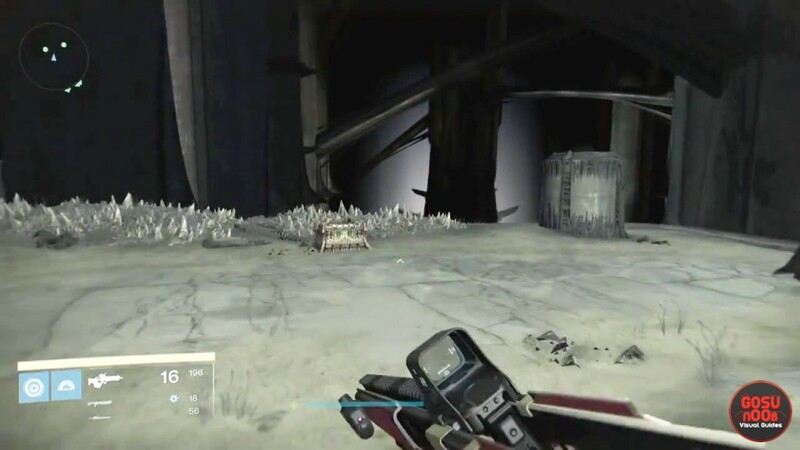 There are several loot chests in the King’s Fall raid in Destiny: The Taken King. They are well hidden, and getting to them requires teamwork and more than a little brain exercise. The rewards are randomized, but they may contain exotic weapons. In this guide, we’re going to show you where to find the secret loot chests in King’s Fall. The first chest can be found in the area where you get across chasms using ships. You’ll find a set of 2 pressure plates before boarding a ship. You’ll need a player to stand on each, so they open the secret door. The remaining team mates should jump on the ship. Just before the ship passes through the giant gate, jump off and onto the ledge on the left. Follow the diagonal ledge and keep looking up from time to time – it passes under the door. Once you go through the door, you’ll see the chest dead in front of you. Once the whole group loots it, go down to the docking area you would’ve ended up at if you hadn’t jumped off. There will be 2 more pressure plates. Stand on them, so the rest of the team can get the chest. This one is in Golgoroth’s Cellar, inside the maze. You’ll discover leaf-like symbols in the corners of the maze – one of them is hidden behind a door. There’s a small opening above the door that can be used to get to it. Use the Ghost to find it. Once you’ve found all the symbols, you’ll have to jump on them in the correct order. Make sure you’ve got controller vibration on, as it will signal when you’re on the right track. Communicating with your team is of the essence here. After fighting Golgoroth, you’ll come to a jumping puzzle (Traverse The Edge objective). It consists of platforms on the walls of a chasm, with traps that push you off them. You’ll start on the left side – follow the trail across. Once you’re back on the starting side, use the Ghost to find invisible floating platforms halfway across the abyss. Jump on them, and go upward. Once you’re high enough, you’ll see an opening on the right side (the one you didn’t start on). Jump inside, and follow the corridor to the chest. 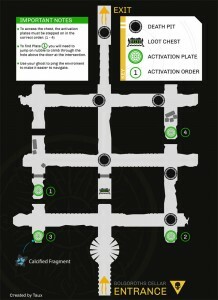 We’ll update the guide with more information as soon as we have it. I was intrigued by reports that the chest in golgoroth’s cellar could drop exotics. I had never seen one in my runs. In your description with the map, you mention that combinations 1-2-3-4 and 1-4-2-3 are the correct combinations to open the door to the chest. My thought was that one combo drops a chest with an exotic chance and the other did not. Since everyone reported using 1-2-3-4, I brought use of the 1-4-2-3 combo to discussion on the Reddit forums. After much testing, it seems that 1-4-2-3 will not open the door and that 1-2-3-4 is the only acceptable combination. Not sure if you care to change your guide, but it seems like many people have referenced it and thought you might like to know about this inaccuracy.